The Well-Read Redhead: Clear Your Shelf GIVEAWAY! 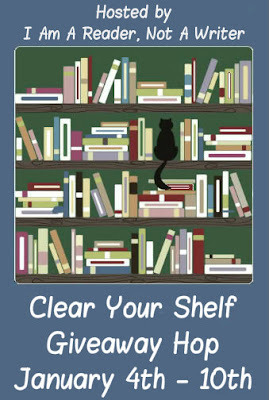 The "Clear Your Shelf" Giveaway Hop is being hosted by I Am A Reader, Not A Writer, from January 4-10! I used to hoard books before Small Fry was born, but ever since he arrived, I've been on a quest to keep my house from becoming over-cluttered. (And nothing clutters better than a toddler and his toy collection.) Plus, I just ordered a ton of books post-Christmas. So I figured now would be a great time to ship off some of my ARCs and once-read books, and spread the reading love! Enter using the Rafflecopter form, and then check out the 90+ other blogs (below) giving away free stuff this week!! You're welcome Gina! Thanks for stopping by! Thank you for the giveaway. I hope 2013 is a great year for you. And for you as well, CB!